What’s the difference between Pallywood and media coverage of Gaza? A number of anti-Israel sites have posted the following photo as an example of the humanity of palestinians. If true, that would be a nice gesture. However, the problem (and irony) is that the evidence suggests the two boys are from Iraq, not the palestinian territories! 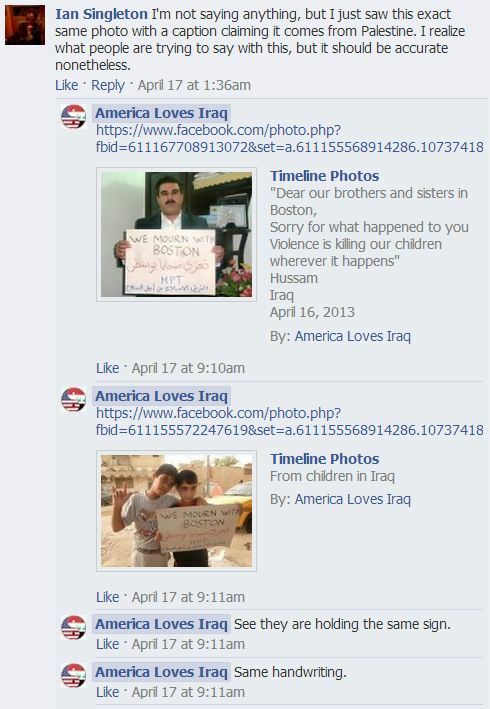 The photo seems to have appeared online first on the America Loves Iraq Facebook page, a day after the bombings. The following comment thread, directly on topic, appears beneath the photo. Obviously, Israelly Cool must be racist for exposing another Pallywood fauxtographic hoax. The non-profit “America Loves Iraq” group first shared the image, which appears to have come from a group called “Muslim Peacemaker Teams”, which is what the “MPT” in the images stands for. The Muslim Peacemaker Teams (MPT) is an Iraq-registered non-profit organisation which began operating in January of 2005 in response to the violence that had erupted in Iraq. MPT states openly that it has no political ambition or religious agenda, though it was inspired by the Christian Peacemaker Teams which have been active in Iraq since 2002. MPT is located in Najaf, Iraq and operates as partner organisation to the Iraqi-American Reconciliation Project, located in Minneapolis, USA. That so called “pro-peace” activists can hijack such images for their own political ends speaks to the lengths to which many will go to in order to either demonise their opposition, propogate lies on behalf of corrupt and violent regimes, or indeed simply try to naiveily paper over the cracks. The attempts are not thought to be directly related to the latest Pew poll statistics showing that 40 percent of Palestinians polled belive that suicide bombings are justified, the highest of any Muslim country in which the poll occured. Taquiya and Kitman. All in the furtherance of a cause.